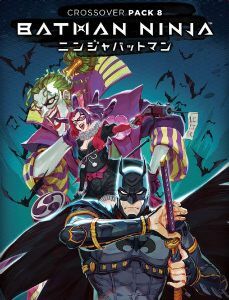 The Super-Villains — The Joker, The Penguin, Poison Ivy, Deathstroke, and Two-Face — are the daimyos who battle from within giant castles that come to life. When the fifth one has been defeated, the five castles merge to become one final titanic challenge. The card backs of the Super-Villains each form a portion of the giant merged castle, with The Joker's head at the top. Each Super-Villain has colors on its four sides matching the main card types: Hero, Villain, Super Power, and Equipment. During your turn, if there is a card matching one of those types in the Line-Up, you must take the card and place it next to the corresponding side of the Super-Villain. When you defeat a Super-Villain, instead of placing it in your deck, you earn each card attached to it. The new keyword "Ninjutsu" provides the heroes some much-needed help as they take on the fearful might of the combined Super-Villains' super castle!